Tooth loss can cause several issues asides from the obvious aesthetic ones. The bony process which holds the tooth in place is also lost as its reabsorbed by the body. This can also cause a reduction in the width and height of the bone where the tooth was lost. The neighboring teeth will move and shift into the vacant space. The amount of leftover food lodged in between teeth will increase, leading to decay of the neighboring teeth, gum disease and more. The neighboring teeth will also be subjected to undue wear and tear by abnormal forces being transmitted to the teeth. These forces can cause fracture of the cusps and other damage. Finally, the loss of teeth may also cause the cheeks and lips to sag giving an aged look. Replacing the lost tooth can prevent the consequences associated with tooth loss. Several options are available to replace a missing tooth, however, dental implants are the number one choice for replacing missing teeth. Small titanium screws are surgically placed in the bone. Posts will be attached to the screws and protrude through the gums. The replacement teeth will be anchored to these posts. The benefits of dental implants are maintaining bone mass, and the implants will not decay since they are made of titanium. Professional cleaning and proper home care can help you keep your implants for several years. While many people missing a single tooth may prefer a fixed bridge instead of an implant, it’s important to note that bridges require adjacent healthy teeth to be carved and cut to fit the bridge. At the same time, there is the possibility of additional costs due to replacements over the course of a lifetime. Which might be necessitated due to decay or gum problems affecting the anchor teeth. Depending on the number of missing teeth; removable partial or complete dentures are another option to replace missing teeth. When compared to natural teeth, dentures have a reduced chewing efficiency that is only more than half than natural teeth. Full dentures rest on the gum causing abrasion and bone loss. Partial dentures put excessive pressure on the teeth supporting the denture, which may lead to eventual tooth loss. In fact, studies have shown that within five to seven years the failure rate of teeth next to a fixed bridge or a removable partial denture is up to 30%. Existing Medical Conditions: Patients that can have routine dental treatments, should be able to have an implant placed. While precautions should be followed for certain conditions, patients with high blood pressure and diabetes usually are successful candidates for dental implants. Implants have been successfully placed in patients who have lost teeth due to periodontal disease or decay. 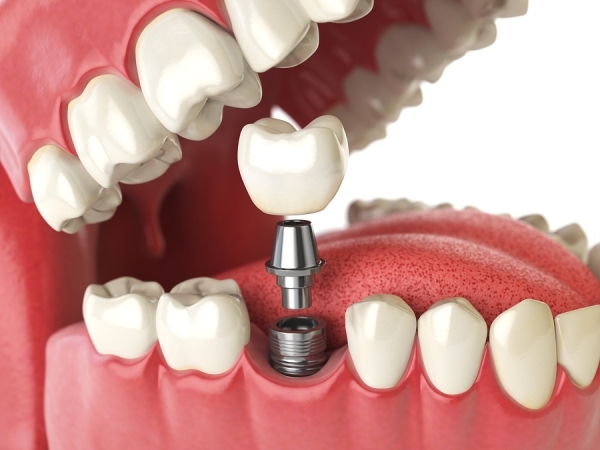 Implants can either be used to replace bridges or dentures or can be used to secure and stabilize the denture. Making dentures more comfortable. Smokers: While smoking lowers the success of implants, it doesn’t prevent patients from getting them. Bone Loss: If a patient has experienced bone loss due to tooth loss or periodontal disease; oral and maxillofacial are able to graft bone to permanently secure the implant. Replacing teeth with implants in children is usually not an option until the development of the jaw is complete. However, a dental implant may be appropriate depending on the child’s orthodontic treatment plan. The implant site is prepared during the first surgical appointment. The area is cleaned and sanitized using strict aseptic procedures. Once the area is clean, the implant is placed in the prepared location. After the implant has been placed, the gum will be sutured over the implant. It will take the implant 4-6 months before it is fused with the bone. The implant is uncovered during the second appointment, and the post to which the replacement tooth is anchored is attached. After an impression of the post is taken, it will be sent to the lab for fabrication of the implant crown. A temporary crown is placed while the final crown is fabricated. Once the final crown is completed, it will be fitted with permanent cement. Our office uses advanced technology to precisely place implants. The use of CT scan, SIMPLANT, and Surgical templates has made new concepts such as Teeth in an hour possible.